Global equities were up marginally in the second quarter of 2018, but this masked the strong divergence between US and international markets. Although emerging market equities outperformed US equities by 12 percentage points in 2017, they gave most of this gain back in this recent quarter. US equities also strongly outpaced foreign developed equities — by nearly 5 percentage points. The aggregate US bond market fell slightly during the quarter. Q2’s news cycle was dominated by threats, and some application, of US tariffs against its major trading partners (more on that in the Outlook and Strategy Positioning section later in this commentary), but investors chose to focus on the near-term boost to US companies’ after-tax earnings from the recently enacted corporate tax rates instead. According to KKR Global Institute, analysts expect US company earnings per share (EPS) to grow nearly 20% this year, but earnings before interest, tax, depreciation, and amortization (EBITDA) to expand less than 10% — the delta largely caused by lower tax rates. The US unemployment rate dropped to 3.8% in May, however wage inflation remains subdued at only 2.7%, basically nil on a real (after inflation) basis. The last time the US ran at 3.8% unemployment was in 2000, just ahead of the bursting of the dotcom bubble and the 2001 recession. Two glaring differences between now and then is the size of the federal debt and the rate at which it is growing (the fiscal deficit). Back in 2000, the strong US economy drove an annual budget surplus that was 2.3% of gross domestic product (GDP), and the total federal debt had been driven down nine percentage points to 54% of GDP over the preceding five years. In stark contrast, today’s federal debt stands at 106% of GDP, and recently enacted tax cuts and increased government spending has put the country on a path of large, and expanding annual budget deficits. As the graphic to the left demonstrates, the US is out of step with all other advanced economies in the world by expecting to run fiscal deficits 10-15 years into the economic cycle. These budget deficits, fiscal stimulus by any other name, call into question the quality and sustainability of the US’s current economic growth. They also suggest that either the recent corporate tax cuts will need to be partially or wholly reversed at some point to reign in borrowing, or if not, US interest rates will rise accordingly to reflect the higher supply of US issued debt. And when US economy eventually does enter its next recession, the pain could be more severe than experienced in 2001 and 2008/09. The US government’s much higher debt levels and deficits rob it of much of its ability to use fiscal stimulus as a stabilizer. Furthermore, the Federal Reserve’s (Fed’s) bloated balance sheet (see chart below), and still low interest rates, limit its ability to stimulate the economy monetarily (i.e. cutting rates and/or quantitative easing). On the topic of the Fed, it raised overnight rates by 25bps (0.25%) during the quarter, to a range of 1.75-2.0%, and flagged the likelihood of two more 25bps rate increases in the latter half of the year — although the market is only pricing in a 30bps increase. This pushed up the short end of the yield curve (i.e., raised rates on shorter duration bonds). However, concern over the negative long-term impacts of a US-initiated global trade war held back expansion in the long end of the yield curve — causing the curve to flatten further. The most popular measure of the yield curve’s flatness, the difference between the rates of 2-Year and 10-Year Treasuries, fell to only 30bps exiting the quarter. Periods of a nearly flat, or inverted (negative) yield curves are challenging for borrowers and lenders alike, and have been a reliable predictor of coming recessions, and more importantly for us, market peaks. As shown on the chart below, the yield curve has inverted five times since the late 1970s, and each time a recession followed within a year or two. There are a few ways I like to think about why an inverted yield curve may appear before a recession. First, long-term rates are reflective of investors’ collective view on long-term growth, inflation, and nominal investment returns — after all, long-term bonds are a competitor to other long-lived assets in investors’ portfolios, such as equities. If investors do not have confidence in returns on equities over the long-term, perhaps because they see a recession coming, they can buy long-term bonds instead. And when demand for a bond goes up, its yield (i.e. rates) goes down. Another way to look to think about the relationship between inverted yield curves and recessions is that the incentive (i.e. reward) to invest in longer-term assets, whether they are bonds or equities, is eroded when their yields (i.e. returns) are similar, or worse, than those for shorter-term assets like short-term bonds or cash in a bank account. An investor may get equal or higher returns, while taking on less risk, by rolling over short-term bonds instead of investing in longer-term assets. And from a business owner’s standpoint, borrowing to invest in one’s operations is expensive relative to returns in the business, as borrowing is typically done at the short end of the curve, and returns in the business are long-term in nature. This freezes crucial business investment which an economy needs to maintain healthy growth rates. It is also bad for the banks, the core of their business is to borrow from depositors at the short end of the curve, and lend to businesses and consumers at the long end of the curve. With another 25 to 50bps of Fed rate increases pressuring the short end of the curve in the second half of the year, and no sign of the Trump administration backing down from its attacks on US trading partners (constraining or perhaps pushing down the long end of the curve), we could see an inverted yield curve soon. We consider the risk of a recession, and a peak in the equity markets, to be rising. The strong and synchronized economic growth experienced by most countries entering 2018 began to show cracks during the second quarter, particularly in Europe and emerging markets. The latter are particularly affected by the rising US dollar and tightening credit conditions being applied by the Fed. Two years after the United Kingdom (UK) voted to leave the European Union (EU), British Prime Minister Theresa May appears to have tentative, but fragile, support from her cabinet to negotiate a “soft” Brexit with the EU — one that will preserve much of the frictionless trade and some of the free movement of peoples between the two regions, but at the cost of continuing to be subject to many of the EU’s rules and regulations. Short of scrapping Brexit entirely, a soft Brexit is the best investors can hope for. The ball will soon be in the EU’s court to decide on, or more likely counter, the UK’s proposal. The EU is torn between preserving the free trading relationship from which they also benefit, and making exit conditions painful enough to prevent other EU members from following the UK’s lead. On an important nuclear proliferation front, President Trump pulled the US pulled out of the Joint Comprehensive Plan of Action (JCPOA), aka the Iran nuclear deal. The reapplication of US sanctions on Iran removed some Iranian oil from global markets, causing the Iranian currency to collapse and global oil prices to increase. 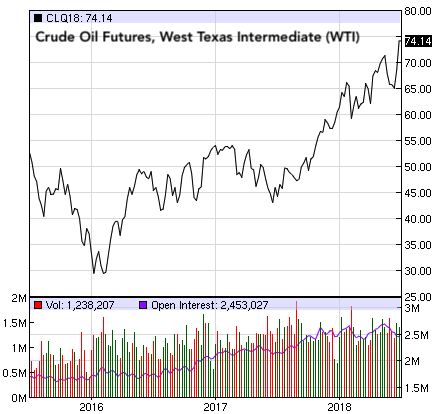 At nearly $75, oil is 50% higher than it was throughout most of 2016 and 2017, and is beginning to show up in global measures of inflation. Iran has not declared its reaction to the US move, but one possible outcome is that it restarts its uranium enrichment activities. On another key nuclear proliferation front, Trump held a highly anticipated meeting with N. Korean leader Kim Jong Un in Singapore last month. Trump proclaimed that “there is no longer a Nuclear Threat [sic] from North Korea” and that N. Korea had returned the remains of 200 US soldiers missing from the Korean War, however subsequent reports indicate otherwise. For his part, Trump agreed to halt joint military exercises with its long-time ally S. Korea. It remains to be seen if China will continue to uphold UN sanctions against N. Korea after the Trump administration applied tariffs on $37 billion of Chinese imports in early July, and continues to threaten tariffs on additional $400 billion. Local financial markets were negatively impacted during the second quarter due to political turmoil in several democratic countries around the world. Spain replaced its prime minister in an unexpected vote of no confidence with a new socialist politician, Italy elected a new populist government which openly attacked the EU during the campaign, a leftist won the Mexican presidency in a landslide, and the autocratic leadership in Poland purged its supreme court. After a strong first quarter, AlphaGlider strategies disappointed in Q2. All five strategies were down slightly (less than 1%), whereas their benchmarks were all up slightly (less than 1%). On a year-to-date basis, our strategies’ relative performance was mixed, with our more conservative strategies outperforming their benchmarks, and our more aggressive strategies underperforming. AlphaGlider strategies were most significantly hurt in Q2 by their underweight US equity weightings, particularly in their exposure to US growth and small capitalization (cap) companies. Having less international business than large caps, small cap companies are relative winners from the Trump administration’s corporate tax cuts and trade war. Our strategies were also set back by their small overweight position in emerging market equities which were hit hard by currency depreciation. Our fund2 of choice in this area, SPDR Portfolio Emerging Markets (SPEM), declined just over 9% in Q2. Our Singapore equity fund, iShares MSCI Singapore (EWS), which is heavily exposed to financials and real estate, also had a rough quarter, down just over 8%. Singaporean financials, just like their global banking peers, sold off on the flattening of the yield curve, and Singaporean real estate was hit by the government raising taxes on foreign and second home buyers in an effort to improve housing affordability. The best performing fund held in AlphaGlider strategies during Q2 was Fidelity Information Technology (FTEC), up nearly 7%. Another strong performer was SPDR Portfolio High Dividend (SPYD), a fund with heavy exposure to the US real estate investment trust (REIT) sector. SPYD was up over 5% during the quarter. On the fixed income side, we benefited from our large exposure to inflation-indexed bonds via Schwab US TIPS (SCHP) and iShares 0-5 Year TIPS Bond (STIP). They were up 0.5% and 0.9%, respectively, well ahead of the Bloomberg Barclays US Aggregate Bond Index’s -0.2% decline. It is the US against everyone, and that is a problem for the US. Trump said “trade wars are good and easy to win” when you run deficits with most of your trading partners. But at best, such a statement is only valid on a 1:1 conflict. The US picked a fight, simultaneously, against all of its trading partners. Even in the early stages of this trade war, more of the US economy is being hit by tariffs (0.36% of GDP), than that of the EU, Mexico, and Japan, and similar to China. Looking at trade between the US and its 15 largest trading partners, US exports make up 5.7% of its GDP, whereas the 15 partners’ aggregate exports to the US make up ‘only’ 4.6% of their aggregate GDP. Bottom line, the US has more to lose (more of its economy that can by hit by tariffs) than its trading partners in this war. At just over $150 billion of trade affected on a combined GDP of over $60 trillion, the impact of these tariffs is relatively modest, and if ended soon, should not derail the global economy. We are still in the early stages of this trade war, but the impacts to date are not encouraging for US industry and consumers. The well telegraphed tariffs on Canadian soft lumber contributed to a near doubling in lumber prices in the US since the presidential election — adding $9,000 to the average new home build. US households were also hit by tariffs on imported washing machines. Prices in the category spiked upward 17% after tariffs were applied on imported washing machines in January. US industrials have been put at a severe disadvantage relative to their international peers by the steel and aluminum tariffs. The chart below shows the price for hot-rolled band (HRB) steel around the world. The HRB price in the US increased over 40% upon application of the tariffs, and is now 50% higher than in Europe or China. Most retaliatory tariffs against US exports did not officially begin until early July, but several important US commodities sold off in Q2 as China began to shift its buying away from the US. For example, US soybean prices fell 20% in Q2 even though Chinese tariffs on them didn’t go into effect until July 6. Approximately one-third of all US soybean production, $14 billion worth, went to China last year, primarily to feed pigs. China aggressively shifted soybean buying to Brazil in Q2, while also seeking out non-US alternatives to soybeans for its pigs. Many US-based industrials are being hit by both US and foreign tariffs. Case in point is Harley Davidson. It announced it will shift some production out of the US because of the 25% EU retaliatory tariffs on its US-exported motorcycles, and because of higher steel and aluminum prices in the US (see earlier chart on regional steel prices). Harley will incur significant costs to shut down its Kansas City factory and to build a new factory in Europe. Harley’s operating margins will decline as costs increase relative to pre-trade war levels. And 800 Harley factory workers in Kansas City will soon lose their jobs. Harley’s share price fell 17% during the first half of 2018 vs a 3% increase in the S&P 500. We are somewhat perplexed by share price reactions to the deteriorating global trading environment this past quarter, most notably the 4.6% and 11.4% outperformance of the US equity market relative to the developed and emerging international markets, respectively. Investors are usually forward looking in their analyses and primarily act on new information, yet it appears to us that they chose to focus more on the past (December’s US corporate tax cuts) than on the present and future (significant increase in the probability of a major, and long lasting, global trade war). It would appear that investors either believe the trade war will end soon, or that the rest of the world will suffer more than the US in a trade war (a common Trump administration refrain). The US equity market continues to be priced at one to two standard deviations above historical averages on most valuation metrics — pricing in a Goldilocks scenario. We find this to be out of line with the realities of the flattening yield curve, Fed tightening (raising rates and contracting balance sheet), high and rising government deficits, a rising US dollar, and the early stages of a trade war in which the US is going it alone against literally the rest of the world. Investors seem to be downplaying the possibility that the Trump administration will follow through on its threat to expand tariffs to an additional $200 billion of Chinese imports in two months, and to another $200 billion at a later date. 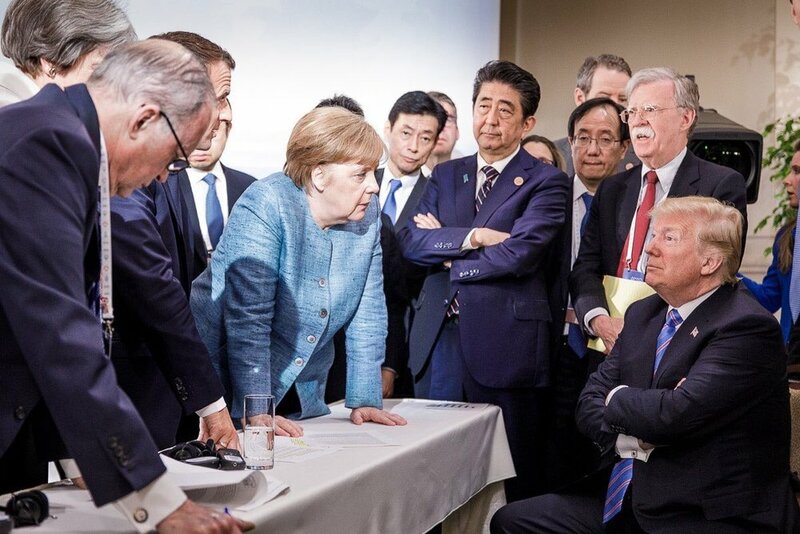 Nor do investors appear to give much credibility to the Trump administration’s threat to apply tariffs on $335 billion worth of imported cars, light trucks, and auto parts, most of which come from Canada, Mexico, Japan, and the EU; nor on the inevitable retaliation against the US by these countries; or on the Trump administration’s threat to pull out of the North American Free Trade Agreement (NAFTA) which covers $1.1 trillion in total trade. For some reason, investors believe that the Trump administration will not follow through on these threats even though it has a solid history of following through on earlier economic threats and campaign promises, such as pulling the US out of the Trans-Pacific Partnership (TPP), initiating NAFTA renegotiations, cutting corporate tax rates, and applying various protectionist tariffs. While we hope the Trump administration will not make good on its draconian tariff threats, we have prepared our strategies to outperform their benchmarks in the event it does happen. We continue to underweight US equities in all AlphaGlider strategies. During this last quarter, we swapped out our well performing high dividend fund, SPDR Portfolio High Dividend (SPYD), for a telecom services sector fund, Fidelity MSCI Telecommunication Services (FCOM). We believe FCOM will be more resilient if the trade war continues to worsen. The telecom services sector is extremely domestic focused, which helps insulate its companies (e.g. AT&T, Verizon, CenturyLink, T-Mobile) from retaliatory tariffs. The sector’s high proportion of domestic revenue and profit also makes it a bigger beneficiary of the corporate tax rate cuts relative to other sectors. And the sector may gain more pricing power as it consolidates (e.g. four mobile operators going down to three with the T-Mobile-Sprint merger, and the recently completed merger between AT&T and Time Warner) and benefits from the recent dissolution of net-neutrality rules. Finally, the telecom services sector is among the cheapest in the US, trading on 14.1x forward earnings, 1.7x book, 3.3x cash flow, and a 3.7% dividend yield, well below the S&P 500’s 17.1x forward earnings, 2.9x book, 12.8x cash flow, and 2.0% dividend yield. Thank you for reading this quarter’s CIO commentary. I hope it has given you a better understanding of how we are thinking about the current investing environment, and how we have positioned our strategies. We look at investing as a game of assigning probabilities to the spectrum of possible outcomes — and right now we find the probability of the severely negative scenarios to be growing, and the probability of the rosy scenarios to be shrinking. We are running conservative, low-beta portfolios (i.e. portfolios that are less sensitive to market movements than our benchmarks) to protect downside. We are giving up performance if this 9+ year old bull market continues to run, but we think it is a good, prudent tradeoff.